Sometimes the world is full of colliding coincidences that are almost uncanny in their timing. Today Susanna Salk and I were filming a group of fashionable designers sharing their sartorial style for an upcoming video to air this September. 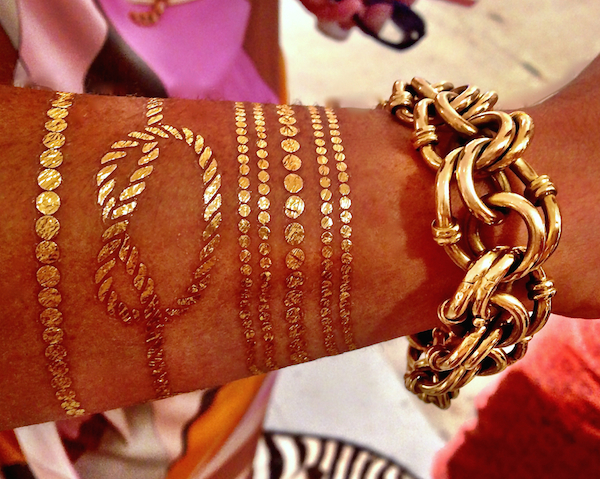 When Amanda Nisbet arrived, I immediately admired and inquired about her chic, seemingly stenciled gold bracelets, below. She informed us they were Lulu DK temporary jewelry tattoos. A new offering from the talented textile designer Lulu deKwiatkowski, they have the same feminine and whimsical appeal as her popular fabrics. 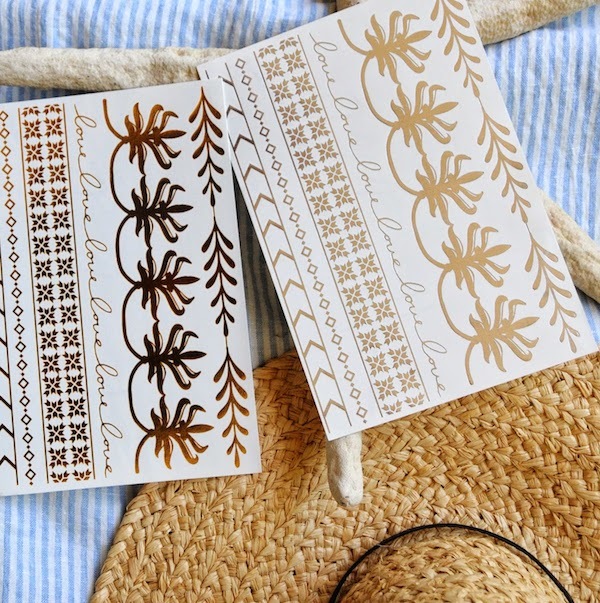 As soon as the shoot was over and I was catching up on my inbox, who should I have an email from but Lulu’s office, announcing the introduction of the temporary tattoo collection. Even those not normally fans of tattoos can see the appeal of Lulu’s temporary designs. In metallic gold and silver, they are a flirty summer way to add a little bling without the cost or bulk of the real deal. From a simple wrist band of beads or nautical knots to the larger more ornamental designs to the flowing scripted words, there are options for all styles, tastes and ages. Easy to apply with water and remove with baby oil, they are safe and non-toxic, lasting about four to six days both in and out of the water. And while I’m not sure I’ll be sporting this look, I think it could look smashing on the right nubile young beachgoer. Translating her artistic hand drawn designs to a creative new medium, I applaud Lulu for thinking outside the box for her new venture. It was such a fortuitous discovery on a day when we were just celebrating the fashionable style of those in the world of interiors. You can find the collection in Lulu’s new online shop. And for a special visit with a stylish design icon who is endlessly inspiring with her unbridled creativity, be sure to stop back on Thursday for Susanna’s and my latest VIDEO! This entry posted in art, design, fashion, gifts. Entry Tags: Lulu DK, Lulu DK lifestyle, temporary tattoos Bookmark the permalink. Lulu is so creative, yes how fun for a summer soiree ensemble! What a great idea, especially for traveling. No danger of losing your jewelry or being robbed. Unless you are accosted by baby oil toting bandits . 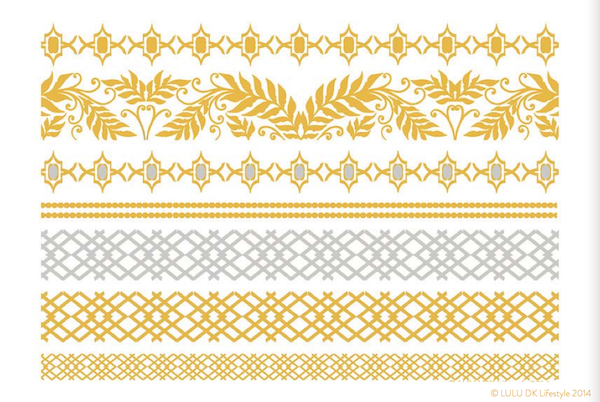 Reminds me of the Henna designs put on hands and feet. Thanks for sharing this! Love it! Such a simple yet clever idea. I would love to be able to resell their tatoos here in Brazil, I’m sure it would be absolute suceso. Gostaria muito de revender aqui no Brasil (Rio de Janeiro), como faço?! I would love to resell here in Brazil (Rio de Janeiro), how do ?! 78 queries in 0.412 seconds.